French poet and adventurer, born at Charleville, in the Ardennes, on the 20th of October 1854. He was the second son of a captain in the French army, who in 1860 abandoned his wife and family. From early childhood Arthur Rimbaud, who was severely brought up by his mother, displayed rich intellectual gifts and a sullen, violent temperament. He began to write when he was ten, and some of the poems which now appear in his works belong to his fifteenth year. Before he was sixteen, in consequence of a violent quarrel with his mother, the boy escaped from Charleville with a packet of his verse, was arrested as a vagabond, and for a fortnight was locked up in the Mazas prison, Paris. A few days after being taken home Rimbaud escaped again, into Belgium, where he lived for some time as a tramp, almost starved, but writing verses with feverish assiduity. In February 1871 he left his mother for a third time, and made his way to Paris, where he knew no one, and from where, after very nearly dying of hunger and exposure, he begged his way back to Charleville. There he wrote in the same year the extraordinary poem of Le Bateau ivre, which is now hailed as the pioneer of the entire "symbolist" or "decadent" movement in French literature in all its forms. He sent it to Paul Verlaine, who encouraged the boy of seventeen (whom he supposed to be a man of thirty) to come again to Paris. Rimbaud spent from October 1871 to July 1872 in the capital, partly with Verlaine, partly as the guest of Théodore de Banville, and served in the army of the Paris Commune. With Verlaine he travelled for thirteen months, after the fall of the Commune, through England and Belgium, where in 1873 he published the only work which he ever printed, Une Saison en Enfer, in prose; in this he gives an allegorical account of his extravagant relations with Verlaine, which ended at Brussels by a double attempt of the latter to murder his young companion. On the second occasion Rimbaud was dangerously wounded by Verlaine's revolver, and the elder poet was imprisoned at Mons for two years. Meanwhile Rimbaud, deeply disillusioned, determined to abandon Europe and literature, and he ceased at the age of nineteen to write poetry. He settled for a while at Stuttgart, studying German, and in 1875 he disappeared. He set out on foot for Italy, and after extraordinary adventures found employment as a day-laborer in the docks at Livorno. Returning to Paris, he obtained a little money from his mother, and then definitely vanished. For sixteen years nothing whatever was heard of him, but it is now known that he embarked as a Dutch soldier for the Sunda Isles, and, presently deserting, fled to Sumatra and then to Java, where he lived for some time in the forest. Returning to Europe, after a vagabond life in every capital, he obtained in 1880 some menial employment in the quarries of Cyprus, and then worked his way to Aden and up into Abyssinia, where he was one of the pioneers of European commercial adventure. Here he settled, at Harrar, as a trader in coffee and perfumes, to which he afterwards added gold and ivory; for the next eleven years, during which he led many commercial expeditions into unknown parts of northern Africa, Shoa and Harrar were his headquarters, and he lived almost entirely with the natives, and as one of themselves. From 1888 to 1891, having prospered greatly as a merchant, he became a sort of semi-independent chieftain, intriguing for France, just outside the borders of civilization. From documents which were first produced in 1902 it appears that from 1883 to 1889 Rimbaud was in close relations with the Ras Makonnen and with Menelek, then only king of Shoa. At the death of the Negus John, in 1888, he was concerned in the formation of the empire of Ethiopia. From this time Rimbaud had a palace in the town of Harrar, and intrigued with the French government in favor of Menelek and against Italy. Meanwhile, in 1886, believing Rimbaud to be dead, Verlaine had published his poems, under the title of Les Illuminations, and they had created a great sensation in Paris. In this collection appeared the sonnet on the vowels, attributing a different color to each: A noir, E blanc, I rouge, U vert, O bleu voyelles. But the author, in his Abyssinian hut of palm-leaves, was, and remained, quite unconscious of the fact. In March 1891 a tumor in his knee obliged Rimbaud to leave Harrar and go to Europe for surgical advice. 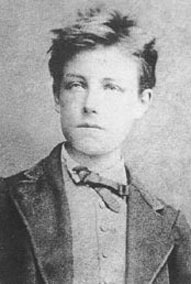 He reached Marseilles, but the case was hopeless; the leg had to be amputated, and Rimbaud died there in hospital on the 10th of November, 1891. The poems of Rimbaud all belong to his earliest youth. Their violent originality, the influence which they have exercised upon younger writers, the tumultuous existence of their author, and the strange veil of mystery which still hangs over his character and adventures, have given to Rimbaud a remarkable fascination. His life has been written by Paterne Berrichon (1897), and valuable reminiscences by his sister, Isabella Rimbaud. His Oeuvres were collected in 1898 by Berrichon and Delahaye, and in 1901 his statue was unveiled at Charleville.